"These were the most difficult courses that I have ever seen!" That's how Charles Scharlau NZ0I described the 2006 World Championships of Amateur Radio Direction Finding (ARDF). Charles and his wife Nadia had just returned from Primorsko, on the Black Sea Coast of Bulgaria, where for the 13th time, the world's best on-foot transmitter hunters gathered to see who would capture gold, silver and bronze. 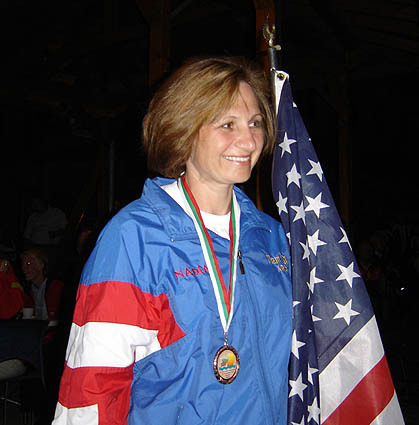 The year 2006 marked the fifth time that stateside foxhunters have gone up against the rest of the world, and for the first time, the Stars and Stripes were raised on the podium during the awards ceremony. 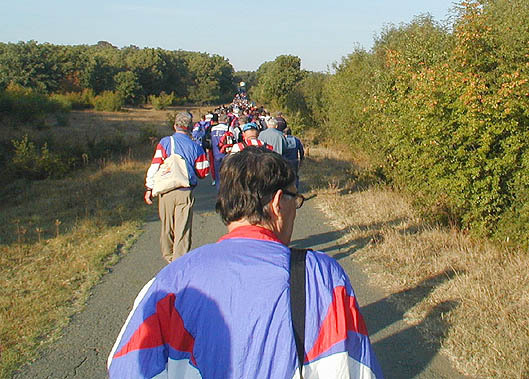 ARDF teams from European countries usually travel to international championships as a group. 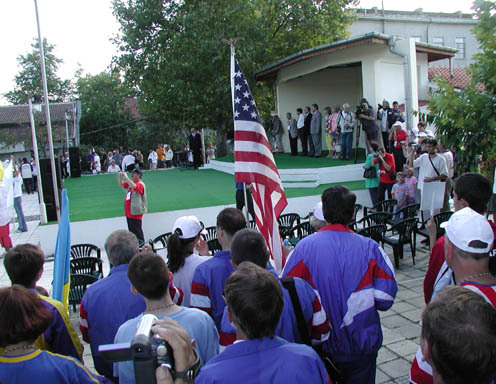 By contrast, Team USA members came from eight states and arrived in Bulgaria over a 6-day period. The closest major airport is in Sofia, necessitating a 7-hour bus ride cross-country to the coastal resort village of Primorsko. Only weeks before, its beaches had been blanketed with vacationing Europeans. 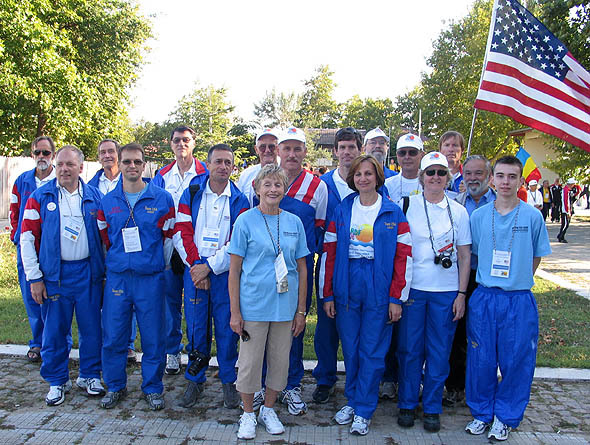 Seven Team USA members participated in training sessions provided by the Bulgarian organizers. 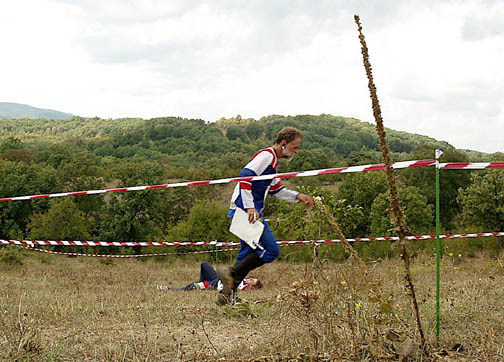 For up to a week before the championships, they joined dozens of others who were working to improve their RDF and orienteering skills in woods and fields next to the Black Sea. Each day's training run was 5 to 7.5 miles with total climb of 350 to almost 1000 feet. Average daytime temperature was about 70 degrees Fahrenheit. NZØI wrote: "We discovered the joys of Bulgarian blackberry bushes. They tend to cover the clearings with about 18 inches of growth, just low enough to fool one into thinking that it is easy to run through them. Don't attempt it without iron gaiters on! The woods were mostly pretty runnable, and a better choice over the deceptive clearings." Unfortunately, some of the early arrivers encountered contaminated food in the cafeteria. On our team, Harley Leach, KI7XF and Vadim Afonkin came down with severe stomach and intestinal symptoms that lasted through the two-meter competition day. The first formal competition was September 14 on two meters. The courses were a bus ride away from the coast and encompassed more than 4800 acres of well-mapped forests and fields. The shortest point-to-point distance for the full 5-fox course was 7.5 kilometers. Bob Cooley KF6VSE (shown at left in 80m course photo by Jay Hennigan WB6RDV) finished ninth in the category for men over age 60, finding all three of his required foxes and missing a medal by less than three and a half minutes. "The first two foxes were easy, but #5 presented much more opportunity for error," Bob explains. "I should have gone northeast to bypass most of the medium green on the map and get on the trails going toward that fox. But I followed the bearing north and spent more time in the medium green than I should have." Bob continues, "Because of signal reflections, it is always a bad idea to hunt a two-meter fox from the bottom of a stream bed, but that is what I did next. I led four people into a dead-end clearing 150 meters northwest of #5. That would have been funny, except that I was in there too. I should have approached #5 on the higher trail that pointed right at it. This would have saved me more than one five-minute cycle." Jay Hennigan WB6RDV finished 16th out of 42 in the category for men between 50 and 59. Jay has greatly improved since his first World Championship appearance in 2004. 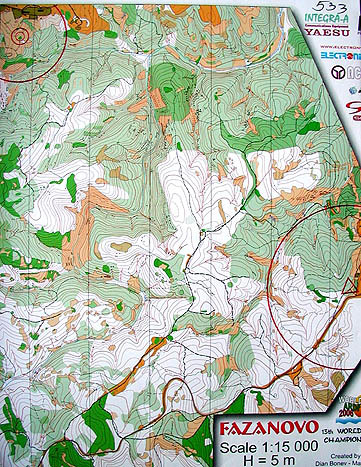 In addition to ARDF practice, he enters many classic orienteering meets to develop his map-and-compass skills. "These were extremely tough courses, physically and mentally," noted NZ0I, who found his four required foxes in just under two hours. "The locations of the foxes made it difficult to select the optimum order. On one course, the top three finishers in one category each took the transmitters in different order. That is very unusual." Charles discovered ARDF in the Puget Sound area of Washington State and competed in our national Championships for the first time in 2001. His wife Nadia learned ARDF as a youth in the Soviet Union and won her first gold medal by competing for USSR at the European Championships in 1984. Both of them represented USA at the last two World ARDF Championships, where Nadia was our team's top performer. In 2002, she took fourth place in her category on one band, finishing within two minutes of the bronze medallist. In 2004, Nadia was again close to a medal when the battery fell out of her 80-meter receiver on the way to her final transmitter. Without it, she had to find the last fox and get to the finish using just her previously-marked bearings. The lost time put her in 11th place instead of perhaps earning a trip to the medal podium. Now on the first competition day in Bulgaria, Nadia finished 7th in her category, taking just ten minutes longer than the gold medallist to find her required four foxes. Nadia agreed with Charles that the two-meter event was very difficult, but she was happy about it. "I knew it would be to my benefit if the courses were hard," she said. "Hard courses favor mental skills over physical skills." Nadia usually places better on 80 meters than on two meters, so she was excited about her prospects for the next event. After a day of rest and touring, everyone climbed back on the bus for a ride to the 80m hunt on Saturday, when Nadia had to overcome adversity again. According to the electronic scoring records, she found her four required foxes in silver medal time, but just as she was ready to go to the end, the Bulgarians' finish corridor transmitter failed for about 15 minutes. USA's progress in ARDF is quite remarkable. Unlike some other countries, all Team USA members are true amateurs, who train mostly at home and pay their own way to all events. This includes Charles and Nadia. "It was a very hot summer here, sometimes 100 degrees," says Nadia. "I tried to run five or six miles on the streets every day after work, but Charles and I didn't have many opportunities to go practice RDF in the woods because of the heat and humidity. Sometimes we would take a couple of transmitters to the park. He would hide one transmitter and I would hide the other one. As soon as I would find his, I would move it. He would do the same and we would repeat five or six times. By then we felt dead because of the heat." 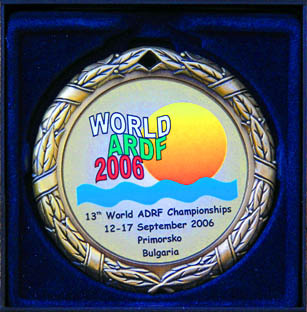 All but three of the 13 competitors on Team USA 2006 earned their places at the 2006 USA ARDF Championships, held April 7 through 9 near Durham, North Carolina. 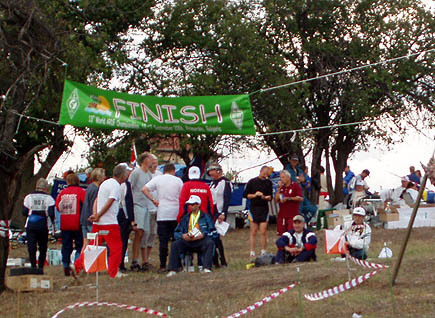 The remainder qualified at the 2005 national championships near Albuquerque, New Mexico. Two of them were Charles and Nadia Scharlau, who were co-chairs of the organizers of the North Carolina championships. Also attending from the USA were two persons who served as members of the international jury. 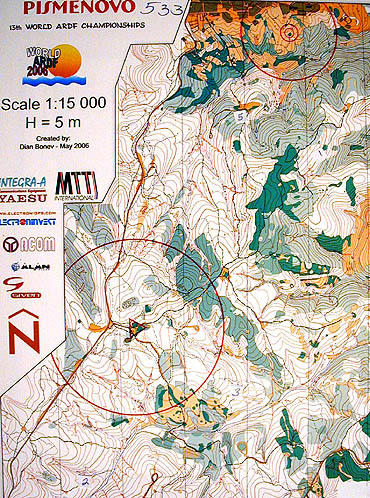 Map of the two-meter competition. Map of the eighty-meter competition. Portions of the report above have been excerpted from my Homing In column in the Fall 2006 issue of CQ-VHF Magazine.